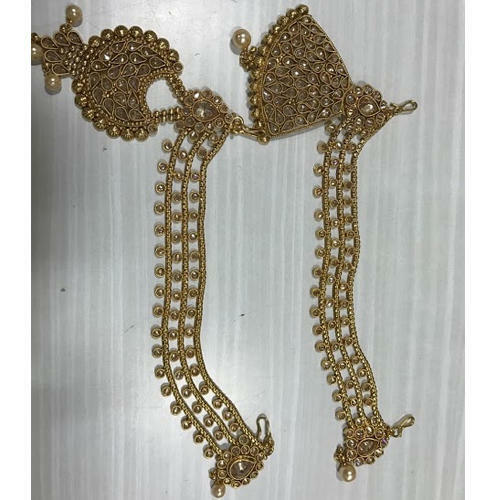 We are offering Antique Damini. Occasion: Anniversary, Engagement, Gift etc. Established in the year 2006, we, Navkarmani Jewellers, are known for Manufacturer, Wholesaler, a wide range of the premium quality of Designer Earrings, Necklace Sets, Pendant Sets, Kundan Necklace Sets, Mehandi Polish Earring Tika Set, Artificial Jewellery and more. we offer a wide range of imitation jewellery items. For designing the offered range of imitation jewelry items as per the prevailing fashion trends, our designers make use of latest crafting tools and quality assured range. Owing to their smooth finish, unique design, excellent sheen and elegant appearance, these jewelry items are highly demanded in the market. Backed by a team of talented designers, creative artisans, competent labor, quality analysts and sales & marketing personnel, we work to attain maximum customer approval and satisfaction. Our professionals work in close coordination with each other, to meet the precise needs of our valuable customers in the most efficient manner. To enhance and polish their skills in the most efficient manner, we provide our customers with regular training sessions. Mr. Saurabh Jain is a proprietor of our company and he has helped us in catering to the precise needs of our valuable customers. Customized oriented approach, ethical business policies, excellent management skills and innovative business ideas of our mentor, has helped us in attaining a commendable position in this domain.